God created the heavens and the earth. He spoke, and everything that is came into being (Genesis 1). On the 6th day he created man (Genesis 1:27), placed him in the garden and asked him not to eat from the tree of knowledge of good and evil (Genesis 2:16-17). Man sinned: he did eat from the tree of knowledge of good and evil. Through Adam, sin entered the world (Romans 5:12). In the same way that Adam and Eve sinned in the garden, man has continued to sin. We have violated God's law and ignored him as the source of what is right and wrong. Take a moment to examine yourself. Do not compare yourself to those around you because if you look hard enough you will find someone who is has done more wrong than you and you will also find another who has done less than you have. Examine yourself, use God's law as the standard of perfection. 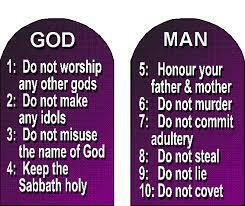 Where have you disobeyed God? ​The Bible teaches us that God, in the righteous judgment, has declared that the penalty for sin is death. This is seen in the 6th chapter of Romans. The word wage literally means price or reward. That is, Romans 6:23 tells us that the reward for our sins is death. We are all deserving of death because as sin entered the world through Adam and Eve, all have sinned. Therefore, we have all earned for ourselves an eternal punishment: we can only pay for our sins if we suffer eternally. Because of our sin, we are eternally separated from God. Man cannot atone or pay for his sins and live. The only way man can atone for his sins is to suffer eternally for them. Since all have sinned, none can live. However, because God is a God of love, he created a plan for redemption: one would pay the price for another so they may live. Thanks be to God that our story does not end here, that all will not perish in eternal punishment. The greatest act of injustice happened on the cross that all might live. Christ Jesus lived a perfect life: He was blameless in the sight of God. He did not sin nor break God’s command. Yet, the wrath of God was poured out on his Son that all might live! Jesus did not only suffer the physical pain of the cross. He incurred God’s anger, God’s justice on the cross, not just for one, but for all. He paid the price for all your sin, past, present and future. For the first time in history, God the father was separated from God the Son. D. How can I be saved? You must believe that Jesus Christ died for your sins to be saved. It is only by his saving grace that you are saved. ​ We have to confess our sins. This means that you acknowledge that you have sinned and do not meet God’s holy standard and then you turn from your sins. You no longer walk in the ways that you once did. If you stole before, stop it. You lied, committed adultery, whatever it was, confess it and move from it. Do it no more. It is just that simple. Find a Bible, read it and obey what God says in his word. It is also important to find a church home, a body of believers where you can fellowship and worship. There is no such thing as a good person. Everyone on this planet is capable of doing great evil. What then is good? Where does our definition of right and wrong come from? The bible says in Proverbs 14:12 that: there is a way that seems right to a man, but its end is the way to death. Is right what society has deemed appropriate or what you have decided is ok? Remember that the heart is deceitful above all things! So, it comes down to this: being a ‘good person cannot get you into heaven. Salvation is in Christ Jesus and him alone. We cannot earn our salvation by being good enough. God created the heavens, earth and man. He gave his perfect standard. His law and made following his law completely the only way to get to heaven. However, no one has ever been able to live up to this perfect standard. Yes, you do not commit adultery; do you lust over a woman in your heart? Yes, you don’t steal but have you lied? No one except Jesus has ever been able to fulfill the Law. Salvation is by faith through Jesus alone! You can never be good enough! If you have ever broken God’s law and commands, then you are responsible to God to pay for that sin. A sin is a sin is a sin. While the earthly consequences for our sins might be very different, all sin has the same eternal consequence: separation for God and spiritual death. Can God forgive me for what I have done? See Galatians 4:19 as well. However, this same bible verse shows us that God’s grace abounds all the more. It does not matter what you have done! Christ paid it all on the cross when he died for your sins. All you have to do is believe in your heart that Jesus died on the cross for your sins, confess those sins and follow him. Justification is another fancy Christian word that means that Christ removed the guilt and penalty of our sin. In his death Christ proclaims those who believe in him as righteous through his blood. Do not live your life as though what Christ did on the cross was not sufficient to remove your sins. It does not matter what you have done. Christ paid it all on the cross! Do cheapen what he has already done for you. Always remember that Jesus’s last words before his death were “it is finished” John 19:30. Jesus forgives you. I said a prayer when I was younger at a youth conference. I must be saved. Yes perhaps you heard the word at youth camp and you received it, but what was the condition of your heart at the time? Did the word fall on the rock of your heart or have thorns come in a chocked the word in your life? Is there evidence of salvation in your life at the moment? In fact, going to Church and a life filled with religious activity cannot save a person either. Although the young rich man in Matthew 19 lived a religious life, he missed out on heaven because he was unable to part with his possessions. We are saved only by the sacrificial blood of Jesus Christ. What do you have in your life that is keeping you from a relationship with Christ? What great possession is worth your eternal salvation? Examine yourself to see if you are in the faith (2 Corinthians 13:5). Examine yourselves, to see whether you are in the faith. Test yourselves. Or do you not realize this about yourselves, that Jesus Christ is in you?—unless indeed you fail to meet the test! Know that you will be going to heaven if you were to die today. Is there true genuine evidence in your life that you know God? Do you produce fruit? Do you love God? Have you turned away from your sin? Are you obedient to God’s word? Do you hunger and thirst for his righteousness and word? So put away all malice and all deceit and hypocrisy and envy and all slander. Like newborn infants, long for the pure spiritual milk, that by it you may grow up into salvation— if indeed you have tasted that the Lord is good. 1 Peter 2:1-3. Do you have a new life? Have you been transformed by his word? God’s love for us is not based on how good we are, how much charity work we do or do not do nor is it based on how many times we go to church! If this were true, Christ’s love would be no different than the world’s love. God has an unconditional love for us. The Greek word for this love is Agape. It is a love based on truth. It is an unchanging love that exalts others above ourselves. It is a love of sacrifice and service. Greater love has no one than this, that someone lay down his life for his friends. John 15:13. A genuinely saved Christian cannot lose their salvation, however, today there are many deceived people who believe they are saved but have no knowledge of Christ. Are you one of these people? Do you know for sure that if you were to die today you would go to heaven? Does Jesus know you? Is your faith filled with religious activity, but no obedience to the word of God? Do you know God? Do you have an intimate relationship with Him? Examine yourself! Do not be that person in Matthew 7. When we are saved, we become a new creation in Christ Jesus (2 Corinthians 5:17). We are a new creation in Christ Jesus, however, we are still stuck in a body that wants to satisfy the desires of the flesh. It is very possible for a Christian to sin. However, for the Christian this will not be a continuous pattern of sin. If there exists a perpetual pattern of sin in your life, repent! Bring it to the cross of Christ, he will wash you clean. We fall short, but God’s grace abounds all the more (Romans 6:1-6:4). If we confess our sin, Christ will forgive us! We cannot lose our salvation.